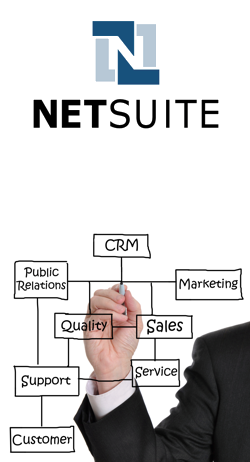 NetSuite is the only cloud Customer Relationship Management (CRM) solution that delivers a real-time 360° view of your customer experience, from lead and opportunity through to sales order management, up-selling, renewals, and service. In addition to advanced Sales Force Automation (SFA), customer support and marketing automation, NetSuite CRM+ delivers capabilities way beyond those offered by traditional CRM systems in a single, cloud-based solution. Clear visibility into sales, service and marketing performance. Elevated productivity with a 360° view of your customers. Improved sales performance through forecasting, up-selling and commission management. Increased customer service productivity and reduced case resolution times. More effective multinational sales and services management with global CRM. Optimise sales processes with complete opportunity management and access powerful tools that drive performance, including sales forecasting, commission management, up-sell management and more. See huge improvements in complete case and escalation management. Accelerate service standards with knowledge-base management, customer self-service and more. Improve collaboration with partners through partner relationship management (PRM) that delivers joint marketing campaigns, joint lead management, partner commissions and order processing. Grow faster with practically unlimited customer segmentation and targeting capabilities, e-mail marketing and true marketing program ROI analysis. Comprehensive support for mobile devices — iPhone, iPad, BlackBerry or Windows Mobile — ensures that your employees can access NetSuite whenever they need it, wherever they might be. Fingertip access to sales, marketing and customer service information lets you measure and optimize performance — you even get back-office metrics for total business visibility.